Essential oils such as jasmine, neroli, clary sage or lemongrass promote peace and tranquility within the home. If you have an oil burner, place a few drops of essential oil in the dish along with a spoonful of vegetable oil. Place a lighted tea light candle underneath to slowly warm the oil. You can also place a few drops of oil into a spray bottle filled with water, and spray the mixture onto furniture, rugs and carpets. Bugs can ruin any al fresco activities, so preparing a defence is essential to avoid being eaten alive by mosquitos and ants. Put a few drops of citronella, catnip, eucalyptus or lemongrass into an electric oil diffuser to deter flying invaders. A few drops of peppermint oil mixed with water in a spray bottle will ward off invading ants. Traditional cleaning products often contain harsh chemicals that can be dangerous to pets and small children. Make your own all-purpose cleaner by filling a spray bottle with a mixture of three tablespoons apple cider vinegar, half a litre of water and two teaspoons of an essential oil such as lemon, peppermint or eucalyptus. Do you know what toxic chemicals are lurking in your shampoo or body lotion? Most store bought toiletries contain irritants such as sodium lauryl sulphate and alpha hydroxy acid. Making your own soaps, moisturizers and shampoos is both safer and economic. Grate a 100 g bar of Castile or olive oil soap into 400 ml of water. Place the mixture on the stove, and boil gently until the soap is completely dissolved. Add your favorite essential oils and herbs to create a non-toxic shampoo and shower gel. Soaking your feet in a hot water at the end of a long hard day can make all your troubles simply melt away. Aromatherapy oils are great ways to boost the de-stressing effects of a soothing foot bath. Fill a foot bath or large plastic bowl with hot water, and add some drops of cypress, geranium, lavender, blue chamomile or vetiver essential oil. Lie back for 15 minutes. You can follow this with a relaxing foot massage using a little coconut oil and a drop of your favorite essential oil. Make a refreshing hair rinse by mixing one tablespoon of apple cider vinegar in one cup of warm water. Add essential oils such as lemon or myrrh to treat a dry, itchy scalp and outbreaks of dandruff. Tea tree and peppermint oil stimulate the scalp and encourage blood flow to the hair. Lavender and jasmine oil add a delicious fragrance to homemade hair rinses and help to add moisture and shine to the hair. Pets can also benefit from essential oils. Always be sure to purchase therapeutic grade oils as perfume grade may be harmful when applied topically or ingested. For a homemade flea treatment for dogs, combine 6 drops of Melrose essential oil with 2 drops of Palo Santo oil. Add this to half a cup of distilled water and a tablespoon of liquid Castile soap. Avoid using this mixture on cats as pine and citrus oils can be toxic, but you can substitute the oils for either lavender or cedarwood. Adding an essential oil to bath water can help to relive tired and sore muscles, detoxify the body and calm the mind. For a soothing bath soak, combine a tablespoon of vitamin E oil with a few drops of oil such as frankincense, marjoram, basil, sage or ylang ylang. For an invigorating soak to open the pores and detoxify the skin, try rosemary, lemongrass, peppermint or juniper essential oil. 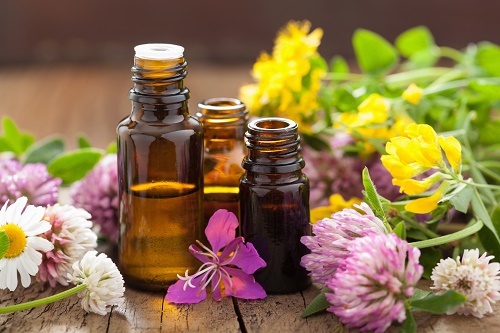 Build your own natural first aid kit using a combination of antibacterial and healing oils. One drop of ginger oil diluted in one drop of carrier oil such as olive oil makes an effective cure for headaches and nausea when taken internally. Tea tree oil is wonderful for minor cuts and scrapes, and lavender oil mixed with water is ideal for insect bites, sunburn and itchy rashes. A drop of lemon oil mixed with a carrier oil provides relief from colds and congestion when rubbed into the chest. Carrier oils are vital when using essential oils as they dilute the oil and help the skin to absorb it. You can choose from many different carrier oils such as vitamin E, olive oil, almond, jojoba or coconut oil. Always test the mixture on a small patch or skin before using to make sure there is no redness or inflammation. The vast majority of oils are hypoallergenic, but you should exercise care when using on animals, children or pregnant women.